Blaine Elementary Principal Troy LaRaviere could become the president of the Chicago Principals and Administrators Association. 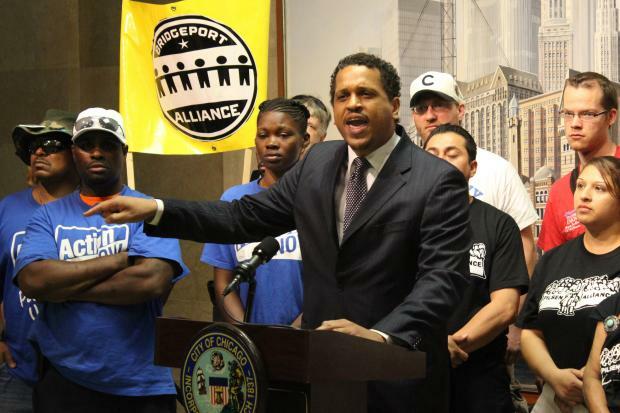 LAKEVIEW — Earlier this year, outspoken Blaine Elementary Principal Troy LaRaviere got a warning from Chicago Public Schools demanding he fall in line with other school principals. Now he could end up leading them. LaRaviere was selected this month as the nominee for president of the Chicago Principals and Administrators Association, he told Blaine parents Tuesday night. While it's just the first step in the process, LaRaviere laid out the timeline of his possible departure from Blaine if elected. Principal Troy LaRaviere says he is not a critic of the Emanuel Administration, just of poor education policy. "But No. 1, I haven't been elected yet," LaRaviere said. "And No. 2, if I should be elected, I will hope to stay in my position here while being president of the organization and continuing to launch the advocacy work I've been doing." The association elects its officers every three years, starting with a nomination committee selecting its top pick for each position. After those names are announced in March, other candidates can petition to join the May ballot. The presidency is a full-time position that begins in July, meaning LaRaviere would have to leave his job as Blaine principal before the 2016-17 school year. LaRaviere said he would not leave Blaine "until there's a principal identified and a date set for that principal to take control." "You don't have to worry about that," he assured parents. But LaRaviere said he hopes to do both if elected. The association is considering hiring an executive director to handle daily operations, leaving the president free to continue his or her duties as a principal, LaRaviere said. "I don't know where those conversations are going to lead, but I'm hopeful we can do that," he said. "I don't have any concerns about my ability to do both." If those plans fall through and LaRaviere is elected, "I would definitely go full-time and vacate my position at Blaine," he said. Clarice Berry has been president of the Chicago Principals and Administrators Association since 2004, when she ran after serving as interim president following the death of former president Beverly Tunney. Berry, who was principal of Fiske Elementary School in Woodlawn before her election, was the nominated candidate in 2013 and was re-elected to her second three-year term. LaRaviere did not say whether Berry intends to step down. In 2014, LaRaviere helped lead a new principals association committee, Administrators Alliance for Proven Policy and Legislation in Education, focused on amplifying principals' voices, according to Catalyst Chicago. The committee formed just a couple months after LaRaviere wrote an editorial slamming Mayor Rahm Emanuel for the "unprecedented political burdens" he placed on educators. Despite his continued pushback against CPS officials, LaRaviere had the full support of Blaine's Local School Council, which unanimously renewed his contract last year. At the time, some parents said they felt LaRaviere was "very dismissive" of their concerns and spent too much time supporting mayoral challenger Jesus "Chuy" Garcia. In August, the Chicago Board of Education issued a warning resolution, admonishing LaRaviere for engaging in "unsatisfactory conduct" and threatening him with dismissal. Specifically, the board took issue with LaRaviere speaking against Partnership for Assessment of Readiness for College and Careers (PARCC) testing and siding with the Blaine PTA, which pushed to get all students to opt out of the two-week test. The board also accused LaRaviere of insubordination during a July 13 budget meeting. Almost immediately, LaRaviere fired back that while he loved his job at Blaine, he would not continue working for CPS "at the expense of lowering my head to incompetence and injustice." The principals association is a branch of the American Federation of School Administrators trade union. Under the umbrella of AFL-CIO, the association also assists administrators at Chicago Public Schools with contract negotiations, legal issues, policy formation and professional development.